Prologis (NYSE: PLD), the largest owner of industrial space in the U.S., paid approximately $82 per square foot for the buildings, which were unleased and in shell condition at closing. CT was represented in the sale by Kevin Dal Porto, Blake Rasmussen and John McManus of Cushman & Wakefield; Prologis was self-represented. NorCal Logistics Center is home to General Mills, KeHE Foods, Allen Distributors and Fox Head, and is in the heart of California’s Central Valley, a 185 million-square-foot industrial market. The region is an extension of a global logistics supply chain infrastructure directly linked to West Coast ports in Stockton, Oakland, Los Angeles/Long Beach, Portland, Oregon and Seattle/Tacoma, Washington. 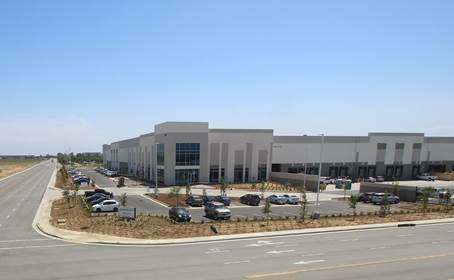 CT purchased the 345-acre industrial site for NorCal Logistics Center in May 2017 and has now completed the first phase development, including a third 1,122,341-square-foot building, one of the single largest speculative industrial buildings in Northern California. The second phase of development will begin toward the end of 2018 and include three buildings totaling approximately 1.6 million square feet of space, the company says. The Visalia Planning Commission has approved a revised conditional use permit to allow construction of a four-story hotel off Plaza Drive and Highway 198. Under the amended application, the 86-room Hilton Home 2 Hotel would be part of the 25-acre Square at Plaza Drive just north of the freeway, an area that already has a hotel and an ARCO AM/PM convenience store and gas station under construction and already includes two car dealerships and a Fresno Pacific University satellite campus. The new hotel’s architect, Steven L. Keike, had requested the Planning Commission allow a change in the location of the building to the northwest corner of North Plaza Drive and West Crowley Avenue, and the commission on Monday approved it. In a separate matter, the members also voted to approve a conditional use permit allowing Brandman University to build a new, 7,071-square-foot building for classrooms and administrative space near the Square at Plaza Drive, within the Plaza Business Park. Brandman officials intend to vacate the 18,240-square-foot building they now occupy in the Visalia Marketplace Shopping Center, next to the city’s Kmart department store, and move into the smaller site, according to a Planning Commission report. 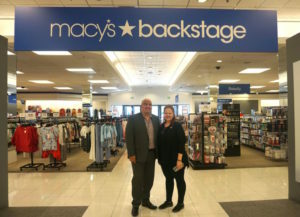 On June 16, Macy’s in the Visalia Mall officially unveiled its newest addition—the off-price retail brand Macy’s Backstage. Macy’s celebrated the event with a DJ, photo booth and food vendors, as well as giveaways throughout the day and scratch-off tickets for the first 200 guests with prizes for the grand opening, according to Raul Diaz, store manager. The ribbon was cut at 9:50 a.m., shortly before the store opened. Over the course of only a month, the clothing retailer transformed 14,000 square feet of its second floor to the company’s newest foray in the fight against slipping sales by introducing “the thrill of the hunt” into its shopping experience. Off-price retailers often work by ordering clothes in volume and out-of-season to sell them at a deeper discount. In the case of Macy’s Backstage, a whole division with its own executives was dedicated to not only shipping but ordering as well. The project began in 2013 with 60 stores, according to Joy Deinla, media relations director at Macy’s and in 2018, it will open 100 new stores across the nation. The store looks like a Ross or Marshalls with racks of discounted men and women’s clothing, footwear, handbags, even furniture and toys. “For us, it’s about the thrill of the hunt,” said Diaz. There are brands familiar to Macy’s shoppers as well as brands exclusive to the Backstage division of the company that shoppers can search through to discover those rare finds. “If there is a brand that matters most to this community, we have the opportunity to communicate that,” Diaz said. This all comes as stores like Macy’s and JCPenney have been falling in terms of sales with the rise of online competition. In fiscal year 2012, Macy’s generated $26.4 billion in revenue which represented 5.6 percent growth for the year, according to the stock analysis website, Revenuesandprofits.com. That percentage fell each year, bottoming out in fiscal year 2017 to $24.837 billion, down 3.7 percent compared to FY 2016, according to Business Wire. Last year, Macy’s closed 70 stores across the country and has closed 156 locations since 2008, with another 11 coming closures announced for this year, according to a June 8 article in the Buffalo News. Part of the problem has to do with competition. Beauty sections have been affected by competition from smaller and sleeker Ulta and Sephora brands while online shopping has affected all ends of the business. To turn that around, the store hopes to use customer experience to bring people in. The ability to feel the clothes and hunt for bargains is an incredible magnet. Being able to touch and feel the clothes is a major draw, said Diaz. Also, sifting through racks is a big part of getting people in the stores. It’s about the treasure hunt. Efros calls it the “fear of missing out,” and its something that Costco and TJ Maxx have done incredibly, she said. Macy’s hopes to bring that same sense of shopping urgency into its main-box stores. It began its off-price retail as stand-alone stores, but they see the store-within-a-store model as supplementing its main store, and according to Deinla, they’ve done so without cannibalizing sales from downstairs. They’ve seen an average of 7 percent growth in stores with a Backstage, said Deinla. The off-price model is something familiar to Visalia. The TJ Maxx opened in 2013 and Home Goods opened at the end of 2015. “Macy’s is also trying to reach that smart shopper,” said Gail Zurek, president of the Visalia Chamber of Commerce. Coming to Visalia was a smart move in her eyes. The percentage of disposable income is high, said Zurek. While the number of rooftops may be significantly fewer, retail sales per capita are much higher, with $14,744 in Visalia compared to $9,619 in Fresno, according to 2012 U.S. Census data. The average median household income from data between 2012-2016 is $52,099 in Visalia compared to $45,963 in Fresno. While smaller retailers may not have access to the ordering volume that can create the kind of sales that consistently draw in customers, there are three lessons to learn as the Macy’s story unfolds. Department stores took on high interest loans that even improved sales are having trouble repaying. Efros cited Neiman Marcus who may have had a 6 percent comparative increase, but its high interest loans offset its ability to make money. One differentiating factor is that customer experience for small companies is more inherent in the business model. “Smaller companies should focus on service and exclusivity versus price,” Efros said. es into one large regional center. Essendant was attracted to Wonderful Industrial park because of its access to an abundant, high quality labor force as well as Wonderful Real Estate Development’s ability to deliver a complex build-to-suit facility within a year of executing the lease. Wonderful Real Estate Development also completed construction on its 1 million sf spec building, 4100 Express Avenue, in May 2018. The building features 300-foot truck courts, 700 trailer parking stalls, 183 dock-high doors, eight-inch slab designed to meet multi-level e-commerce uses, roofing that can accommodate 2.25MW of solar and a high-speed fiber optics network. Wonderful’s newest space also features 40-foot clear heights and well-spaced columns to allow for automated picking systems and highly efficient racking, as well as customizable office and mezzanine spaces. Please contact Joe Vargas (joe.vargas@wonderful.com) or Erin Poulson Morris (erin.poulson.morris@wonderful.com) at Wonderful Real Estate Development for more information. TEJON RANCH, Calif. (March 26, 2018) – The partnership of Tejon Ranch Co. (NYSE: TRC) and Majestic Realty Co. today announced major discount retailer Dollar General (NYSE: DG) is leasing more than 240,000 square feet of warehouse space in a new building the partnership developed at the Tejon Ranch Commerce Center (TRCC). Dollar General will use the new facility to support its operations in California. The tiny home trend is taking off in downtown Clovis. Last year, the city launched an incentive program aimed at encouraging builders, homeowners and do-it-yourselfers to build compact cottages in the city’s downtown core. And so far, it’s worked. Since August, 10 permits have been issued with seven of those under construction. One project is nearly complete. As part of the program, the city provides, for free, a choice of three building plans, saving the homeowner nearly $10,000. The homes vary in square footage from 374 to 498. Dwight Kroll, the city’s planning director, said the city is working toward adding much-needed housing as well as making downtown’s alley’s more attractive and pedestrian friendly. To qualify, the cottage home must have alley access and be within a specific downtown boundary. The city has identified more than 300 sites where the homes can be built. “Not only is Clovis responding, but we are also getting attention from other cities, including Modesto, Chico and Santa Barbara,” Kroll said. Also enticed by the program are Fresno City College and Clovis Unified. The schools may be using the program as an outdoor classroom by allowing students to participate in building the home. The first cottage home to be constructed belongs to Scott January, who built his 374-square-foot home on his property on Baron Avenue just east of downtown Clovis. January didn’t hesitate when he heard about the program. He said it will serve two purposes by providing additional rental income but also be a place for a caregiver to stay. He built the cottage next door to his father’s home. He is nearly finished with the cozy home. Three columns hold up a low roof that provides shade for the front door. Inside is the living area and kitchen. There is space for a stackable washer and dyer and a bedroom with a bathroom. January handled most of the construction himself. He’s a high school wood shop and auto shop teacher, so skills and tools were not an issue for him. January plans to rent the tiny house for about $700 to $800 until he needs it for his father. January said his dad is adamant about not moving to a rest home, so when the time comes that his father needs extra help, the small house will be used by a caregiver. “I’ve had a lot of people drive by and ask me about renting the home, so I know there is a demand out there,” he said. For more information about the Cottage Home Program, email Clovis city planning technician Maria Spera at cottagehomes@cityofclovis.com. The San Joaquin Valley Air Pollution Control District is partnering with a maker of zero-emission off-road technologies to deploy the state’s first mobile power stations at the Port of Stockton, officials announced last week, a move that will boost air quality around the port and improve public health. “This project is a great example of how the cap-and-trade program is fighting climate change while improving local air quality and delivering benefits to disadvantaged communities,” California Air Resources Board’s Maritess Sicat said in a statement. The MPS is an off-road battery-electric mobile platform that offers multifunction capabilities that can replace multiple pieces of single-purpose, conventional diesel off-road equipment, the Muncie, Indiana-based DANNAR said, and will help accelerate the commercial deployment of zero-emission off-road technologies. Because ports, airports, warehouses, and logistic centers throughout California today rely primarily on diesel technologies to move, load, and unload higher tonnage loads, the project will significantly reduce greenhouse gas emissions, pollutants and diesel emissions to benefit surrounding disadvantaged communities, DANNAR officials say. The port will be using two battery-electric 30,000-pound capacity forklifts with additional cargo handling attachments, including a multipurpose cargo truck bed and scissor-lift. ChargePoint, the world’s largest network of electric vehicle charging stations, will install two DC fast-chargers at the port to support the equipment. Funded in part by the California Air Resources Board through California Climate Investments, the project is part of California Climate Investments, a statewide program that puts billions of cap-and-trade dollars to work reducing greenhouse gas emissions, strengthening the economy and improving public health and the environment — particularly in disadvantaged communities. The cap-and-trade program also creates a financial incentive for industries to invest in clean technologies and develop innovative ways to reduce pollution. At least 35 percent of these investments are made in disadvantaged and low-income communities. “The San Joaquin Valley Air Pollution Control District is excited to support the deployment of zero-emission off-road equipment in our effort to reduce mobile source emissions, which remain the largest source of pollution in the Valley,” the San Joaquin Valley Air Pollution Control District said in a statement. The California economy appears to be sidelined while the broader U.S. economy is accelerating, according to a new report released Wednesday by the California Lutheran University Center for Economic Research and Forecasting. Its current forecast anticipates annual growth in California’s real GDP of 3.2 percent in 2018 and 2.7 percent in 2019. At the current growth premium could vanish within the forecast horizon, the report says. But Central Valley growth has picked up to the point of being greater than the state’s growth in 12 of the past 13 months and is increasing at a rate substantially faster than the nation. “Attitudes and policies are friendlier to development and growth” in the Central Valley, the report says. The economic outlook for the nation continues to be strong relative to the pre-corporate tax reform environment. “We expect growth of the U.S. economy to average 2.7 percent in both 2018 and 2019, better than all but one year since the Great Recession,” says the report. “We view the unemployment rate as a flawed measure of labor market strength,” the report says. “The civilian labor force participation rate stands at a low not seen since 1978. The March 2018 forecast marked what appeared to be a turning point in the economic outlook for California. “In March, we wrote: ‘We are currently forecasting a convergence in the economic fortunes of California and the nation. While California has historically grown at a rate that is significantly higher than the nation’s, 2017 may have marked a turning point…. While growth was accelerating around the country, it appeared to slow down in California. We are forecasting that this dynamic continues in the years ahead. It is even possible that the growth premium maintained by California may vanish altogether,” writes economist Matthew Fienup. Because California competes with other regions for the opportunity to host high value-added business activity, other regions can develop a competitive advantage by cultivating pro- business policies, says the CERF report. “Eventually, businesses of many different kinds will begin migrating to these favorable environments,” it predicts. “Early evidence of this dynamic was provided by California’s world-renowned movie industry — or should we say, Georgia’s world-renowned movie industry,” Mr. Fineup writes. The apparent slow-down of California’s economy noted in the March publication coincides with a significant increase in net domestic out-migration, the report says. “Households and individuals, dominated by younger, working age adults, are fleeing California in increasing numbers. In March, the coincidence of these two patterns led us to wonder if the convergence that we have been anticipating between California’s economy and the nation’s might finally be imminent. “With the advent of this forecast publication, the situation seems a little different than what we observed last quarter, although the fundamental story is unchanged. Most notably, there has been a significant upward revision to California’s growth number for 2017. Even with the revisions, the CERF economists say that the slowdown of California’s economy relative to the nations is real. “We have repeatedly described housing markets in the United States and California as one characterized by restricted supply. Not only are housing starts low as economic expansions go, but they are lower in this expansion than they were in previous recessions,” writes CERF economist Dan Hamilton. While housing sales have risen from the depths of the recession, they are still relatively low, although not as dismal as housing starts. This is due to two main reasons: weak job growth and sustained price growth. “To be clear, we are not saying this price growth represents another housing bubble. Price growth appears to be due to fundamentally low supply,” he says. In a first for San Joaquin Regional Transit District and Stockton, Pacific Gas and Electric Company says it will conduct an electric vehicle pilot program to support RTD’s long-term electric transportation needs with chargers and infrastructure improvements. Recently approved by the California Public Utilities Commission, this pilot will be a test case for PG&E’s new “FleetReady” program, which supports electric charging for customers with medium-duty, heavy-duty, and off-road fleets such as transit agencies, school districts, and delivery fleets. For this new pilot with San Joaquin RTD, PG&E will test how smart charging and battery storage can lower operating costs and maximize efficiencies for the agency. Seeking to partner with a transit agency located in a disadvantaged community which already had electric buses and plans for more in the future in order to meet the timelines of the project proposal, PG&E chose RTD.